When you first have your newborn the emotions are overwhelming and every second is precious. What also comes with that sweet baby is a nice bundle of expenses, some necessary, and some not. 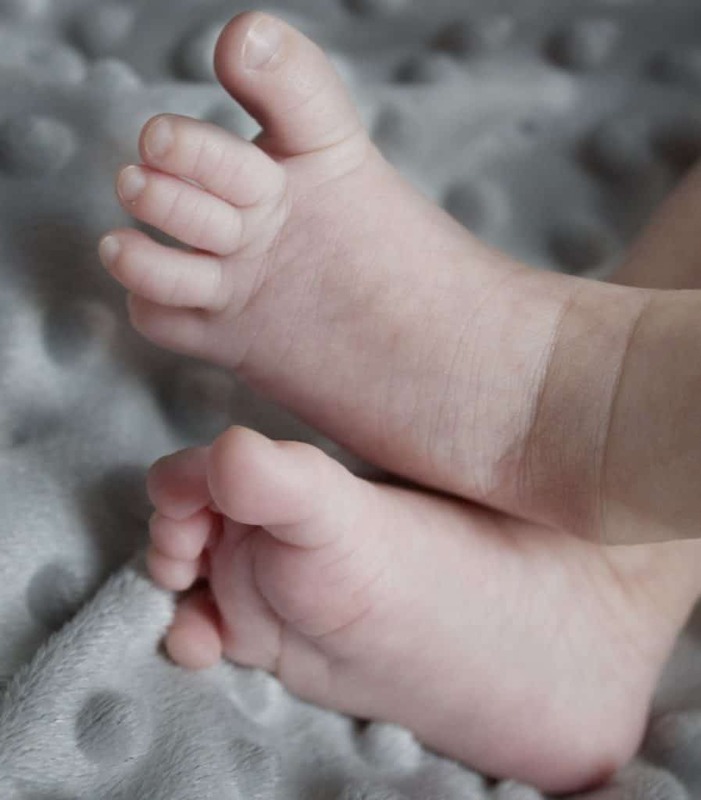 Taking newborn photos of your newborn is totally necessary, but since paying for the diapers and medical bills comes first sometimes they fall by the wayside. 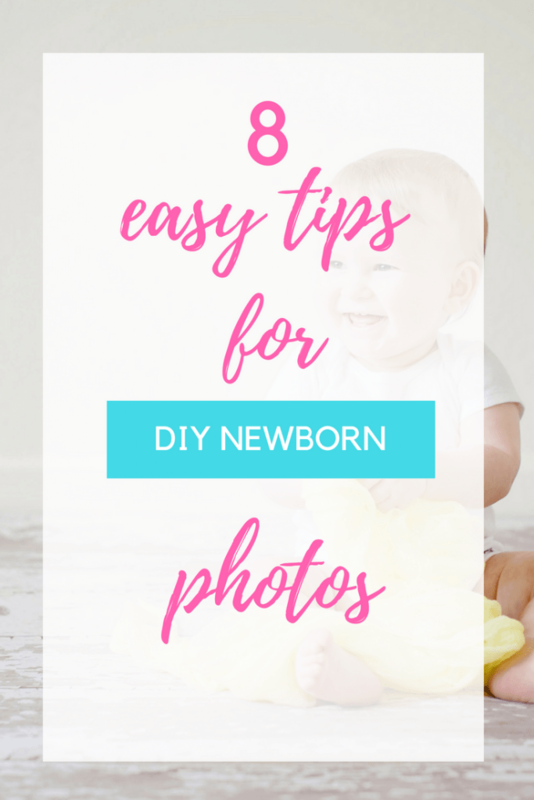 Doing a baby photoshoot at home may sound daunting, but taking DIY newborn photos is a great option when you are in a tight money squeeze! 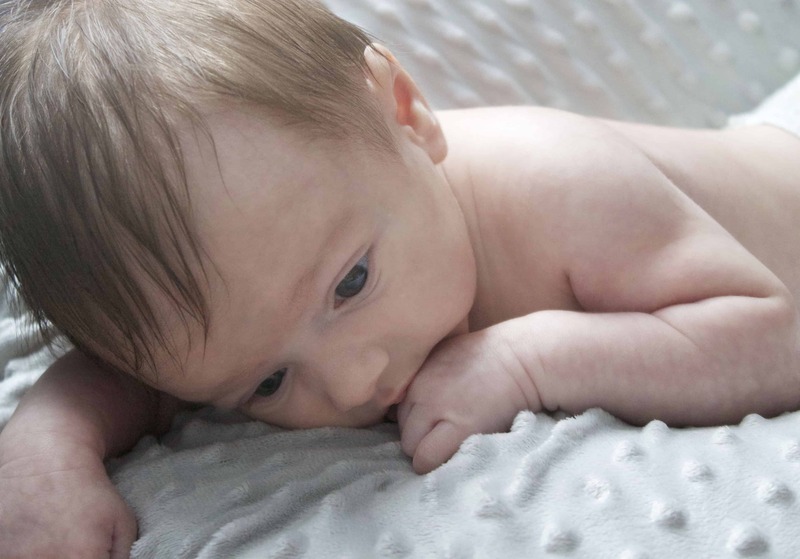 When we had our first little one there was no way we could afford newborn photos. Don’t get me wrong- a good photographer is completely worth the money. They work very hard and spend a lot of money to get the right equipment and programs to do their job. 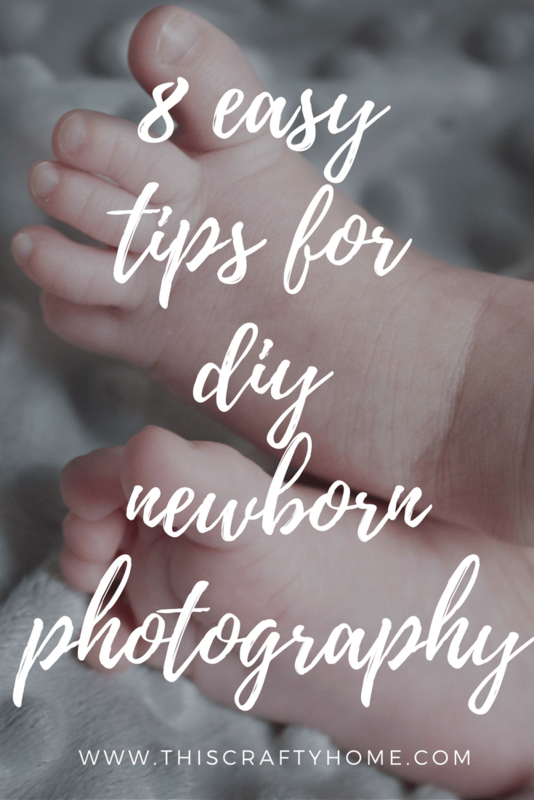 Since I was already somewhat handy with a camera, I researched everything I could about taking DIY newborn pictures and learned some things along the way. There are affiliate links below, they cost you nothing help support This Crafty Home! 1. 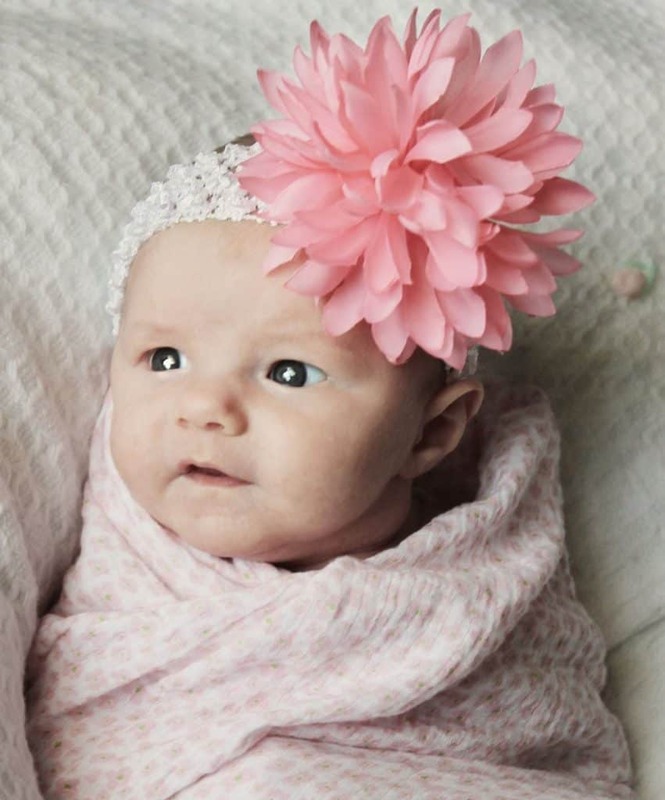 Pick the right time of day for lighting for a baby photo shoot at home. Personally, I would do these photos inside near a nicely lit window. So you’ll have to juggle a few factors here- when is the best light coming through and will it time right with a happy or sleepy baby. 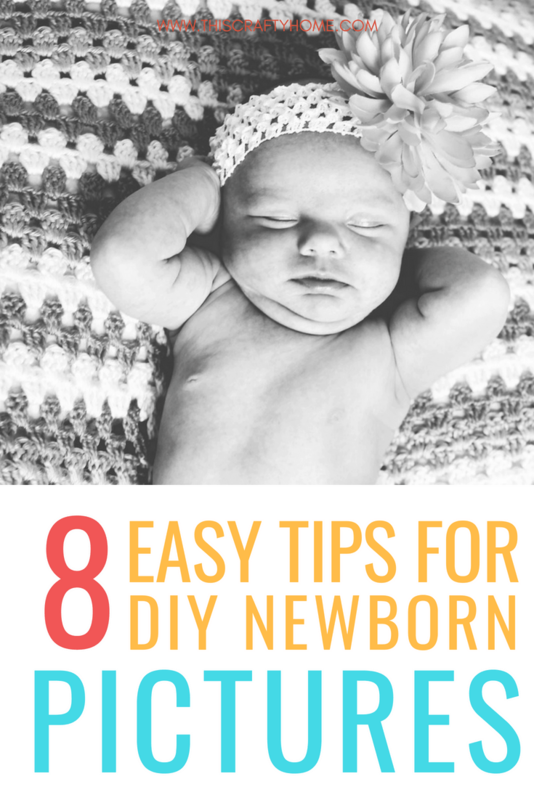 Luckily newborns will usually cooperate if you nurse or do a bottle directly before your shoot. 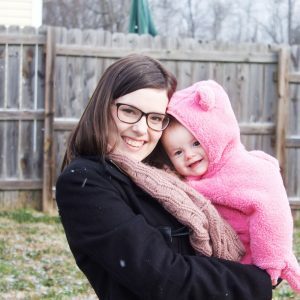 Also, a perk to doing this on your own is if the light or the baby isn’t cooperating, there is no reason to just wait until the next day and try again! If you can, buy a large foam whiteboard from your local craft store and use it to bounce light from your brightest window to your baby, this will help boost your natural light. You’ve probably already started this, but come up with a list of poses and shots that you love. Starting a Pinterest board is the easiest way to do this! Get a top 10 together and make those your goal at first. 3. Pick your props and backgrounds. Your backgrounds are super important but can be a super easy task. I picked out several of Abby’s baby blankets that were given to her or made for her and ones with texture but were one solid color. This gave me a variety of things to work with. For props using things like a boppy pillow or basket works super well! Just make sure the basket is well padded (check out this set from Amazon that helps cushion/prop baby in baskets for shoots). The basic goal here is to find different ways to prop up baby so you can get them in a position without having to hold them there. Make sure to refer to your pictures from tip 2 to gather any other props you need to make the pictures special. 4. Take off the diaper. 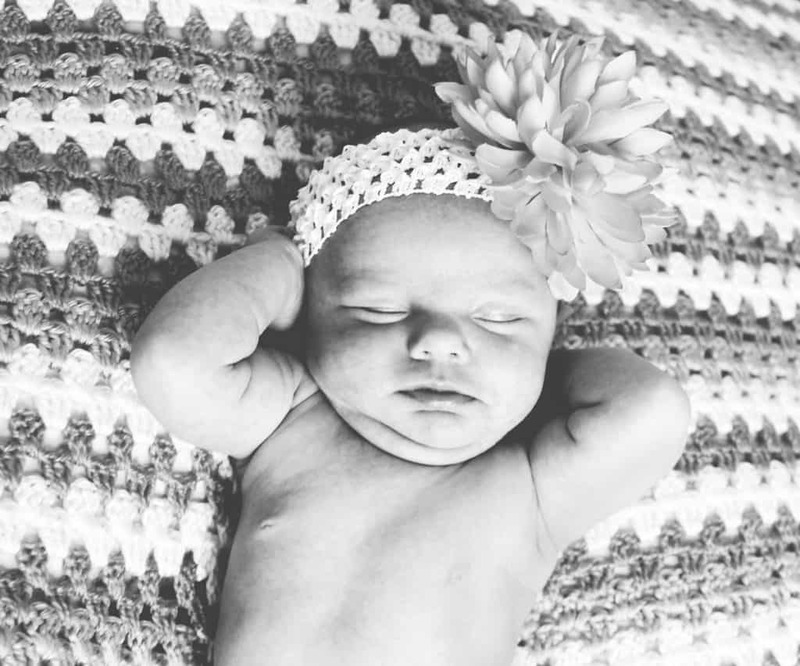 Seriously- who wants to see an ugly baby diaper in sweet pictures? You can use a diaper cover if you like or opt for nothing and sneak a puppy pad under the blanket/background so you don’t get pee all over the place. 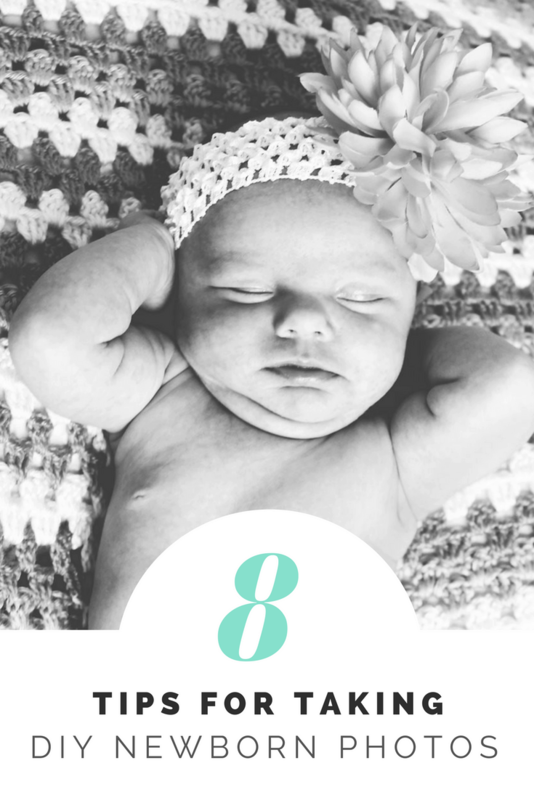 This may sound crazy, but I wasn’t crazy about getting pee all over my bed while taking baby pictures, and it worked! 5. Pay attention to your angles. Here is where you really look at what level the photo you want to recreate was taken at. Do you need a step stool? Do you need to crouch down and be even with baby? Thinking through this simple step will really take your photos to the next level! 6. Be ready for those random moments. Your little one may crack a smile or a face you just can’t miss. It can easily make the sweetest photo that you didn’t expect like the one below. Make sure to keep your camera on and ready. 7. Be mindful of your backgrounds. While you’ve chosen a blanket as a background or something else like the floor, make sure to pay attention to what is actually in your shot. If a blanket is your background and your arent shooting straight overhead try to prop the blanket up at an incline by having a friend hold it or securing it to a headboard to make sure you don’t get random walls or clutter in your shot. Keep it simple! 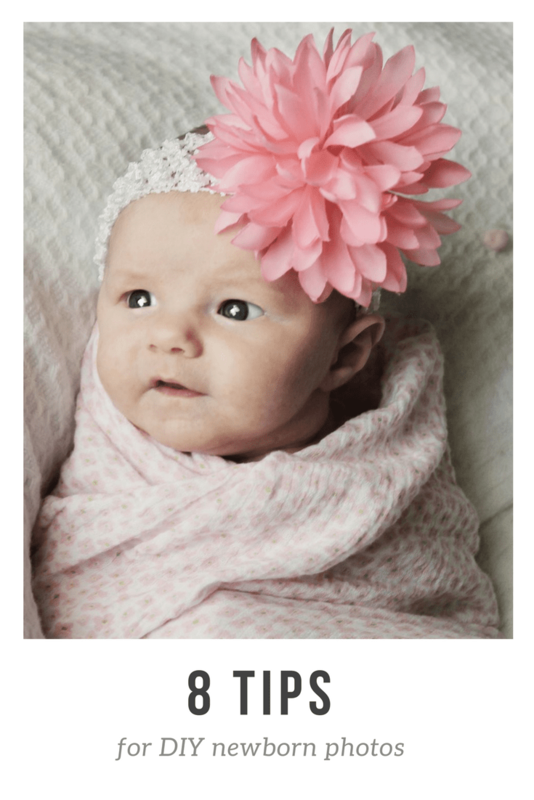 Babies are so precious there is no need to over-edit them. A few simple things you can do is lighten to photo a bit, reduce reds a bit, and crop appropriately. These should be options in just about any photo program. If you are really interested in making your photos look more professional, try out a service like Bluprint to check out an editing class. You can start a free trial here! 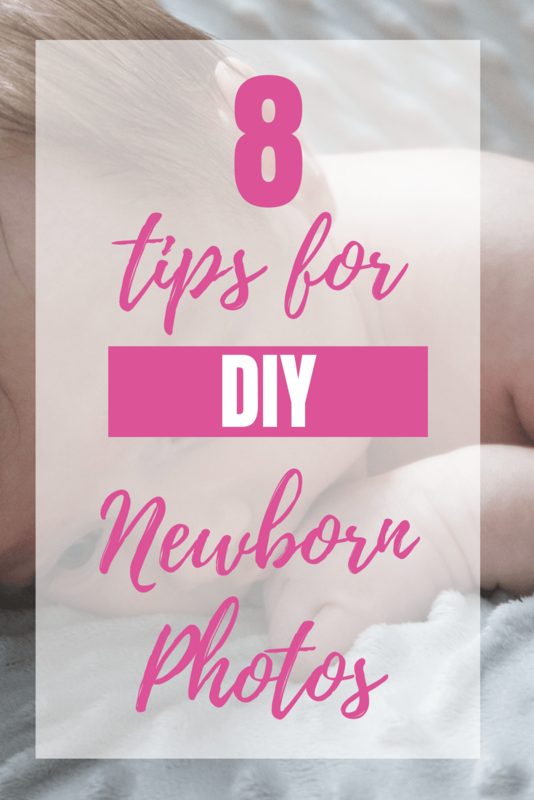 Have any of your own DIY newborn photo tips? Share them below! Love this post? Share these tips with your friends! I always admire newborn photos so much! It’s such a talent to be able to put them in those adorable positions and to make them look like perfect angels!! You’re photos are STUNNING!! That is so sweet Lindsay! It is a total talent, that’s why I would never ever knock a photographer for charging like they do. It’s not easy! My tip is to borrow a good camera from a friend. 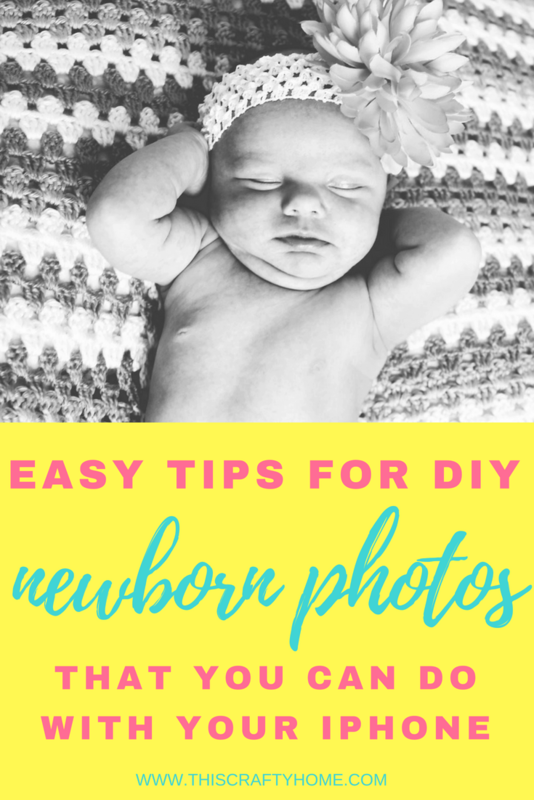 It’s hard to blow up those lovely newborn photos if you use your smart phone. Any DSLR will be very sharp compared to a phone. Absolutely Andrew!! I’ve been pretty impressed with some smartphones abilities lately but I completely believe you still can’t beat a good DSLR. Thanks for reading!